Presented here is the crown jewel of the '90s and one of the most important rookie cards of the future Hall of Famer. 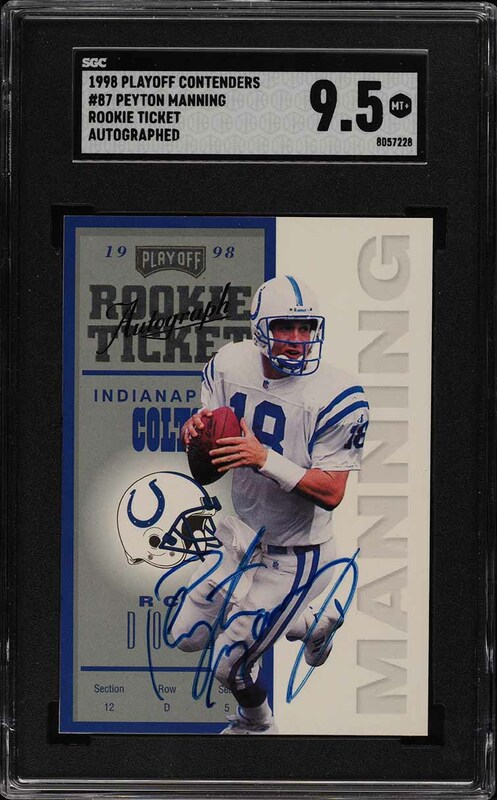 The '98 Playoff Contenders Autograph Ticket Manning is one of those cards that is just as iconic and influential to modern day culture as the immortal who's printed on it. Offered here is a virtually flawless, MINT+ copy which ranks among the finest examples in the world. Boasting pack fresh eye appeal, this card exhibits four keen corners along with smooth edges and thick card stock. Possesses clean borders with precise registration and superb surfaces. The card is almost entirely absent of typical chipping or scratches with vibrant color and a tremendous illustration of #18. What truly caps this card off though is the seemingly pristine on card autograph; a very rare and unique quality for the hypersensitive issue. Posting an unprecedented five NFL Most Valuable Player Awards and 71,940 career passing yards, Peyton Manning will forever be known as an all-time great and one of the most important figures to ever play in the NFL. 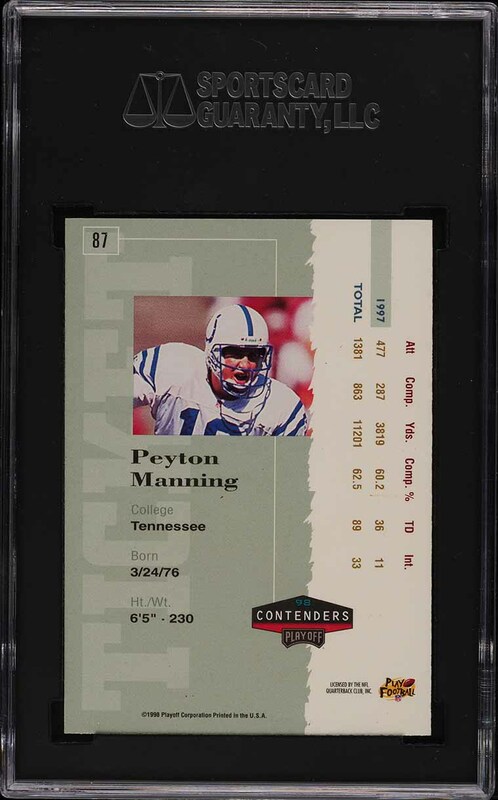 With the combination of Peyton Manning's brand and his incredible feats as a NFL Quarterback, we feel that this critically important rookie card will generate a high return on investment over the years. Don't miss your chance to acquire this world-class commodity. Comes highly recommended by PWCC. One of nearly 15,000 cards, lots, and sets up for bid in our 4th Auction of 2019. Click on the link above to view the other PWCC auction lots. The PWCC Vault is now live! Open a PWCC Vault account and receive a custom Vault shipping address. Purchases shipped to the Vault receive free shipping and reflect Oregon's 0% sales tax rate.